Based on the forensic audit reports in the algo scam, enforcement proceedings have been initiated against the National Stock Exchange (NSE), its past and present officials, stock brokers and other connected entities, says the ministry of finance. Subhash Chandra Garg, secretary in the department of economic affairs under the ministry, while replying to a letter from Bharatiya Janata Party (BJP)'s member of Parliament (MP) Dr Kirit Somaiya, stated, "The investigation in the matter, taking into account the findings made in the forensic audit reports and other available facts, has since been completed. Based on the findings of the investigation, enforcement proceedings have been initiated against the NSE, the former and present officials, stock brokers, their directors, employees and other connected entities and individuals for violation of provisions of SEBI (Prohibition of Fraudulent and Unfair Trade Practices Relating to Securities Market) Regulations 2003, SEBI (Stock Exchange and Clearing Corp) Regulations 2012 and various circulars and direction issued under SEBI Act, 1992." 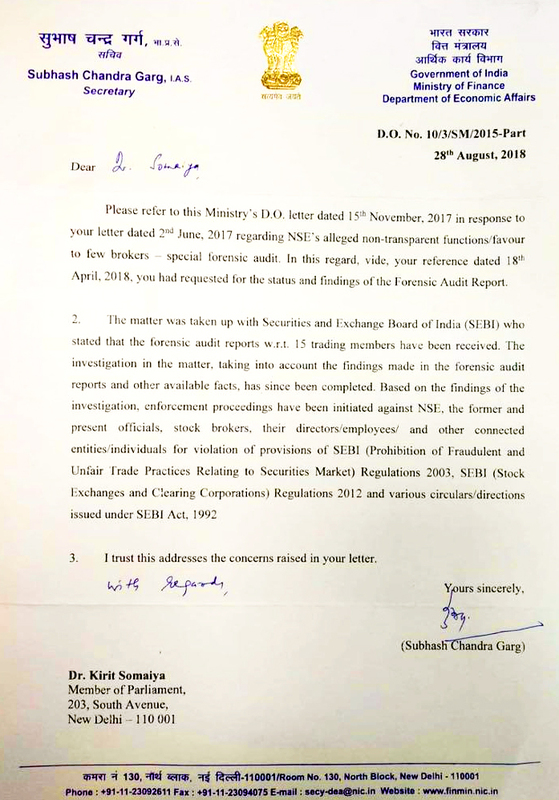 In his several letters, Dr Somaiya, the MP, has been asking for information about NSE's alleged non-transparent functioning or favours to a few brokers and special forensic audit. Earlier in June, SEBI (Securities and Exchange Board of India) chairman, Ajay Tyagi, told reporters that the market regulator is initiating action in the NSE algo or co-location scam, first exposed by Moneylife by publishing a whistleblower’s letter in June 2015. "SEBI has received inputs from forensic auditors and technical entities and action is being initiated against institution and individuals in NSE co-location case. The action will be made public in a few days," Mr Tyagi had said. 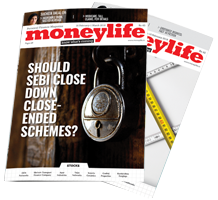 While the algo scam has been known for three years now, since Moneylife exposed it in June 2015, SEBI hasn’t shown much action. 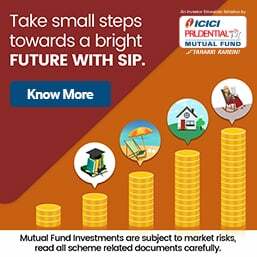 Taking a lead over SEBI, on 30 May 2018, CBI filed a first information report (FIR) against Sanjay Gupta, owner and promoter of OPG Securities Pvt Ltd, Aman Kakrady (brother-in-law of Sanjay), Ajay Shah (who is alleged to have facilitated Mr Gupta by developing and providing Algo software Chankaya) besides some unnamed officials of the NSE and SEBI. The nine-page FIR, filed on 30th May, is based on ‘source’ information; but it goes straight to the issues that SEBI officials have been shirking for three years. In these three years, the main investigation into this issue was directed by the highly regarded chairman of SEBI’s technical advisory committee (TAC), headed by Prof Ashok Jhunjhunwala. Later in July, SEBI issued show causes notices (SCNs) to 15 entities including the NSE, Ravi Narain and Chitra Ramakrishna, both former managing directors of NSE and Mr Shah, a former official at the ministry of finance along with some brokers. In 2017, NSE submitted to SEBI a forensic audit report related to its colocation (colo) activities in its cash market, currency derivatives, and interest rate futures markets. The report was prepared by Ernst and Young and Hyderabad-based Indian School of Business (ISB). Soon, the income-tax (I-T) department conducted raids on premises of top officials of NSE and brokers named in the co-location issue. A report from Moneycontrol.com had stated "These officials and brokers included NSE's former Managing Director (MD) and Chief Executive (CEO) Chitra Ramkrishna, Suphrabhat Lala, and Sanjay Gupta, promoter of OPG Securities." It may be recalled that Moneylife was the first to expose this scam in mid-2015, for which NSE had filed a defamation case against us. A single-judge had penalised NSE for Rs50 lakh for having filed a case against us. After filing an appeal against the order, NSE paid up the penalty. Meanwhile, in the wake of the scam, the top brass of NSE had to resign and a new management team took charge. Market regulator Securities and Exchange Board of India (SEBI) has reportedly asked five top officials from National Stock Exchange (NSE) to 'stay out of action' in the co-location or Algo trading scam. These officials include Ravi Varanasi, NSE's chief of business development, Suprabhat Lala, senior vice-president for regulatory and investor services cell, SRVS Nagendra Kumar, chief business officer for debt, Deviprasad Singh, vice president and head for IT and Mahesh Soparkar, vice president of special projects at the Exchange. "People with knowledge of the matter say SEBI’s directive has come after the Central Bureau of Investigation (CBI) intervened and filed a first information report against SEBI officials and others in the colo case. CBI is probing a complaint of abuse of the tick-by-tick architecture of the NSE server. It is alleged that exchange employees may have deleted important mails, texts and logs with the intention of destroying electronic evidence," the report says. SEBI is of the view that there were serious corporate governance lapses at the exchange and the KMP will have to answer for them. Meanwhile, the NSE has filed another consent application with SEBI based on fresh show-cause notices (SCN) served on 4 July 2018. Earlier in March, SEBI returned NSE's consent application citing pending investigations in the algo scam case. While NSE was trying to go for a consent order in its algo or high frequency trading (HFT) or algorithmic (algo) scam to “put the past behind” and launch its initial public offering (IPO), on 3 July 2018, the market regulator issued a second set of show cause notices in its probe into the algo scam. The second set of SCNs alleges that NSE has undergone practices of denial of services to certain stockbrokers resulting in discrimination and non-adherence to principle of fairness and equal opportunity by allowing Way2Wealth (W2W) and GKN Securities to terminate the connections directly in the rack placed inside the exchange’s co-location facility. This, the SCNs says is in complete contradiction to normal practice followed by NSE. W2W and GKN were allowed to establish P2P connectivity through service provider Sampark, while many stock brokers who desired to lay P2P connectivity through providers other than the four mentioned in the NSE circular on 31 August 2009, were denied permission by NSE staff. It has also been alleged that NSE lacked a clear documented policy for due diligence of service providers by checking their licence while allowing P2P connectivity. To make matters worse, NSE allowed W2W and GKN to continue to avail Sampark connectivity even after finding out that Sampark did not have the requisite Department of Telecommunications (DoT) license. Furthermore, in the process of providing connectivity, a site inspection was conducted for other stockbrokers such as Millennium, GRD and SMC while the same procedure was not followed for W2W and GKN. The notice further names Chitra Ramakrishna, acting MD and CEO of NSE at the time, as it was her duty and responsibility to create investor confidence in the integrity of the market and also to ensure that the stock exchange abides by all the provisions of SEBI. Subramanian Anand, group operating officer (GOO) & advisor to MD and Ravi Varanasi, Head of business development function have also been asked to reply to the SCN. Allowing entities like NSE to file consent applications is a mockery of justice. As it is SEBI is closing the stable door after the horses have bolted. NSE should firstly be made to postpone its IPO till all investigation is complete. When an institution like NSE is as crooked as some of its brokers, the least SEBI can do is clean up the mess conclusively. I think this is a fit case for a suo moto investigation by none other than the Supreme Court. I believe in some way this needs to be brought to the notice of Supreme Court. Market regulator Securities and Exchange Board of India (SEBI) has issued a show-cause notice to Dr Prannoy Roy and his wife Radhika, both promoters of New Delhi Television Ltd (NDTV) for alleged insider trading. In a regulatory filing, NDTV says, "This to inform you that Dr Prannoy Roy and Ms Radhika Roy, the promoters of NDTV, have informed the Company that on 10 September 2018, they have received a show cause notice (SCN) dated 31 August 2018, issued under Sections 11(1), 11(4) and 113 of the Securities and Exchange Board of India Act, 1992 (SEBI Act) by SEBI, alleging violation, inter—alia, of provisions of Section 12A (d) and (e) of SEBI Act read with Regulation 3(i) and Regulation 4 of SEBI (Prohibition of Insider Trading) Regulations, 1992." "The Promoters of NDTV are in the process of seeking legal advice to take appropriate action in the said matter. Since the Company is not a party to the SCN, there will not be any financial implications of the SCN on the Company," NDTV added. NDTV closed Tuesday 3% down at Rs34.30 on the BSE (Bombay Stock Exchange), while the 30-share Sensex ended the day 1.34% down at 37,413. Drama going on for a long time. the soap opera is going to continue.